Best in Bangkok – best in Asia? 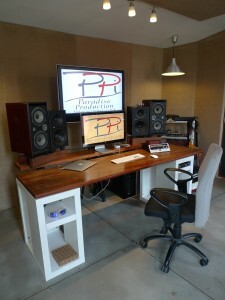 The studio in Paradise Production is custom-made from scratch to meet the highest international standards. The Control Room is designed with top-of-the-line equipment and has an interior furnishing to create a relaxed atmosphere – with plenty of room for everyone involved in the recording and production. The Vocal Booth is engineered to be dead quiet – and has enough space for the talents to feel comfortable and able to act freely. The Equipment is state-of-the-art, guarantees clean sound from recording to mix. We use high quality microphones, preamps as well as top class converters.